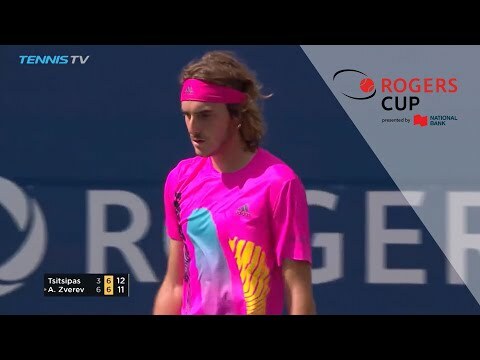 Peter Polansky recorded his fifth Rogers Cup main-draw victory earlier today with a tight 7-6(3), 6-4 win over Australian Matt Ebden in one hour, 34 minutes on a scorcher of a Toronto afternoon. The blazing heat, however, wouldn’t last long – matches would be suspended due to torrential rain midway through the session. But before the weather rained on the Rogers Cup parade, fans were treated to several quality matches across the grounds, including home-favourite Polansky’s win over No. 52-ranked Ebden. The match was played on even terms throughout the first set, with Polansky unable to generate a single break point on the Australian’s serve. Both players were unbroken in the set as they headed into the tiebreak, but the quick Centre Court conditions allowed for 13 aces between the two of them and some fun, all-court play, including a scintillating point capped off by a Polansky half-volley mid-way through the set. The Canadian, who is coming off an ATP Challenger Tour title in Granby (his first since 2016), was playing with confidence and managed to out-steady an increasingly erratic Ebden in the tiebreak. He would carry that momentum into the second set, securing the win with a first and final break of the Australian’s serve. Up next for Polansky is either Wimbledon champion Novak Djokovic or Hyeon Chung of South Korea. Elsewhere, Fernando Verdasco overcame Peter Gojowczyk 6-2, 6-2, winning 76% of points on serve and breaking the German four times in a match that lasted under an hour. Ilya Ivaskha recorded his first-ever Masters 1000 win when he defeated Yuichi Sugita 6-2, 6-3 and will play the winner of Ryan Harrison and Mackenzie McDonald, who earn his spot in the main draw as a lucky loser following the withdrawal of Roberto Bautista Agut. Daniil Medvedev rebounded from the lengthy rain delay in the afternoon to pull off a minor upset over No. 13 seed Jack Sock, who continues to struggle in 2018 following a career-best season in 2017. The night session will see Milos Raonic take on No. 10 seed David Goffin and Vasek Pospisil playing Borna Coric for a spot in the second round.